Mexican built FIAT 500 1.4 MultiAir For USA. 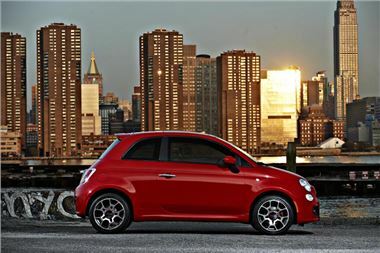 FIAT announced its return to the North American market at the Los Angeles international Auto Show. Its first product is to be the 500, built in Mexico, with a 1.4 litre MultiAir engine. .
"The Fiat 500 has always been the right car at the right time," says Laura Soave, manager of the Fiat brand in North America. "With the new Fiat 500, a truly exclusive car in one of the most rapidly growing segments in North America is being introduced. It offers prestigious Italian design, value and efficiency, all smartly calibrated for our market. “The Fiat 500 satisfies the new generations of Americans who want a captivating, customised, ecologically sustainable and technologically advanced vehicle that reflects their image. Like its historic predecessor, the new Fiat 500 redefines the concept of transportation and gives a new sense to expression and individual opportunities. "At a time when America is returning to simplicity with renewed attention focused on the environment, our new car identifies with the current minimalist bent and offers an advanced and eco-sustainable technology enveloped by an aura of top quality, precision and style." Produced in Mexico and with a starting price of $15,500 (£9,750), this A segment four seater comes with a brand-new 1.4 litre MultiAir engine, Blue&Me hands-free communication system and seven airbags supplied as standard (two in front, two window-bags, two side bags and one for protecting the knees), not to mention the reactive head restraints that activate in case of shunting accidents. This package is further enhanced with a brand-new six-speed automatic transmission, as offered in Europe in the Alfa Romeo MiTo. The Fiat 500 range in the United States offers three trim levels (Pop, Sport and Lounge), one engine type (100 HP 1.4 MultiAir), 14 exterior colours, 14 colour combinations and materials for the seats, two interiors (black or ivory) and a complete line of exclusive accessories made by Mopar, the Chrysler division now owned by FIAT, to further customise the car, including decal packages, stylish accessories for interiors and exteriors and merchandising in original Fiat style, available at local dealers. One of the most interesting contents is Blue&Me Tom-Tom, the multifunctional portable navigation system with an original design developed for the model with an innovative vehicle integration technology. Among other things, the Fiat 500 customer can make use of the free eco:Drive software application that collects journey data through the Blue&Me interface of the car, and analyses it to give the user handy personalised tips to cut travel costs and the environmental impact of driving style. The US specification Fiat 500 offers a standard total warranty of four years/50,000 miles and four years of unlimited roadside assistance, in addition to a three-year/36,000-mile maintenance plan with parts subject to wear and vehicle downtime reimbursed. new high quality BOSE® Energy Efficient Series audio system with six speakers and subwoofer. Adapted to the needs of American customers, the Fiat 500 is equipped with a new four cylinder in- line 1.4-litre engine boasting innovative MultiAir technology developed and patented by FPT − Fiat Powertrain Technologies − that assures excellent performance in terms of power, fuel consumption, quality and precision. categories. The engine is perfectly calibrated to the Fiat 500, supplying 101 HP (75 kW) at 6500 rpm and torque of 133 Nm at 4000 rpm. The 1.4 MultiAir can be combined with a choice of two sturdy, reliable and sophisticated transmissions for the North American market. They have been designed exclusively to offer greater efficiency and more enjoyable driving. In particular, a new six-speed automatic transmission ensures fluid gear shifts and considerable savings in fuel costs. For a more exciting driving style, the Auto Stick function allows the gears to be shifted manually. When selecting the Sport mode by pressing a button on the instrument panel, the transmission gear shift programme and steering response are automatically re-calibrated to achieve even sportier driving dynamics. The second gearbox – a five-speed manual − is fitted with new transmission ratios for the American market, offering lower fuel consumption and increased acceleration. This transmission offers, as standard equipment, a new self-adjusting hydraulic clutch that makes it possible to always exert the same force on the pedal for the entire useful life of the clutch, thus guaranteeing virtually maintenance-free operation. When the Sport mode is selected with the manual gearbox, the throttle and steering response is re-calibrated to achieve sportier driving dynamics.